The brain activity of expert writers. To become a better writer, you have to write! More practice is better and infrequent or irregular practice is not helpful. A 2014 brain imaging study published in the journal NeuroImage is adding to the available evidence on the value of practice in writing. In the study, experienced fiction writers were compared with novices completing realistic writing tasks. 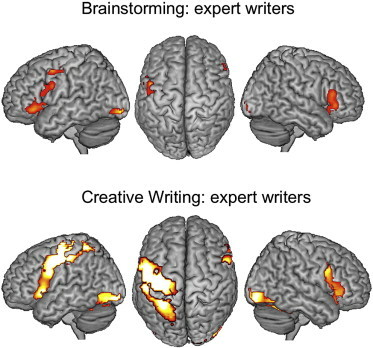 The researchers used an fMRI to produce images of the writers’ brains at work. The result? The experienced writers had different areas of the brain activated than the novices, suggesting that the time spent practicing had re-wired their brains to become more proficient at writing tasks. “…expert training seemed to develop cognitive writing skills into an automatic, implicit, and efficient process…This implies that the task demands of creative text production fitted the experts’ writing style better — executing many decisions, strategies, relevant and well-learned skills (e.g., writing performance, language skills, sentence construction), and attaining domain-specific goals (e.g., characteristics of literary genres, engaging the readers’ interest) in an automatic, unconscious and intuitive way. Seeing this kind of evidence is encouraging. But we need not wait for pictures of brains as definitive evidence that practice is a good thing for student writers! Practice – especially practice giving good feedback and using feedback to revise – is well understood to be the best kind of learning activity. This is why a good writing classroom is a writing workshop, and why many teachers use Eli to create the best opportunities for student learning! Writing Practice Changes the Brain was published to the Eli Review Blog in the category Around the Web.